Are you always on the lookout for ways to clear the clutter at home? I know I am so today’s guest post has some lovely ideas on storage and how to introduce it into your home. Storage isn’t the most glamourous of home décor topics but investing in superior storage can give your home a completely fresh dynamic. Cluttered spaces can add a chaotic feel to your home and one way to create chic rooms is to invest in adequate storage. With this in mind, here are three ways to keep clutter at bay. Going through each room in your home and getting rid of all of the things that you don’t use anymore can be extremely therapeutic, but what if you don’t want to throw your old things away? If you think you’ll never use them again you can always give a few things to charity but if you do think they will come in handy one day, you can always put them in storage until the time comes when you want to dig them out again. Vacuum packed storage bags and unsightly boxes give household storage a bad name. In reality, storing your belongings doesn’t have to be so dull. Sites like Pinterest provide you with buckets of inspiration and show you savvy ways to store everything from jewellery and shoes to makeup and accessories. You can create visually stunning storage solutions with everyday items that you have lying around in your garage. 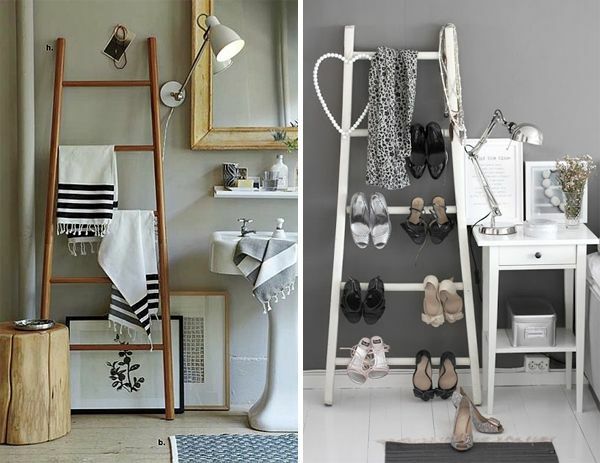 For example, you can create a chic shoe rack by lining up your stilettos on the rungs of a ladder. The beauty of this storage solution is that you can fully take advantage of the vertical space you have, taking up minimal floor space as a result. This is a great all round storage solution for accessories such as shoes, scarves and statement jewellery. If you have a room in your home that isn’t being utilised, why not change its purpose and expand your storage capacity. For example, if you have a basement room or a loft that has become a dumping ground for things that have no place, have a clear out and create a functional space. A basement room or a loft space is the perfect place to store your luggage collection or your outdoor equipment or if you like to keep fit, why not store all of your exercise equipment in there and turn it into a mini gym? So, there you have it, three ways to transform a chaotic home into a tranquil space. I love that shoe rack, much prettier than normal ones I have seen. Great shoe rack, so pretty and glam! Loving the idea of making more of a focal point from my shoes. I may just give that a try. The ladder idea is great, very unusual.